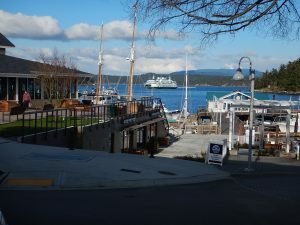 Comments Off on Spring is almost here in Friday Harbor! Spring is almost here in Friday Harbor! Okay, so we’ve had some snow on the island this winter and the wind has been cold off the water, but it doesn’t fool Mother Nature. She knows her timing and spring is close. The trees are starting to bud, the crocuses are blooming and the daffodils aren’t far behind. The feeling of spring is there, although somewhere beneath the layers of wool and Gore-tex. Many things are happening here on the island, including the first annual fund raiser for the Friday Harbor Film Festival! We were able to enjoy a lovely dinner, with a silent and live auction, while the Oscars were live-streamed. A great reason to get out the fun dress-up clothes and enjoy the night. Check out the current Winter Film Series at http://www.fhff.org/. Hellebore plants enjoying the sun! Other exciting things are happening here in Friday Harbor. There’s a new brewery and public house being built in town. We’re waiting to hear what the name of it will be. We’ll post the name and website as soon as it becomes available. If you come up with a suggestion for us to pass along, send it to John at jdl@windermere.com . The new brewery at the end of A Street. Same great location for Downrigger’s! Downrigger’s is back in action as well and has risen from the ashes of the fire like a phoenix. 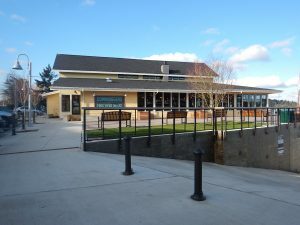 Enjoy the new bar area that looks over the harbor and ferry dock, as well as the open dining room. For more pictures and the updated menu, here’s the website: http://www.downriggerssanjuan.com/. As the traditional ebb and flow of the seasons continues, remember that we are here to help you with your San Juan Real Estate needs, whether that’s looking for a piece of land to build your dream home or deciding that it might be time to downsize your current home as your life has changed. Each situation begins with a conversation, so let us know how we can help you.